Custom cabinets can make a world of difference in any size kitchen. 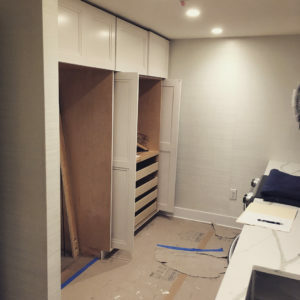 If you’re preparing for kitchen remodeling, Philadelphia PA’s A-K Custom Interiors will help you maximize your space while adding style and function. Take a look at these two kitchen renovations to see how we completely redefined these kitchens with custom woodworking. This compact Philadelphia PA kitchen was sorely lacking in the storage department. As anyone living in Northern Liberties knows, square footage is at a premium. Luckily for this client, there was a simple fix. 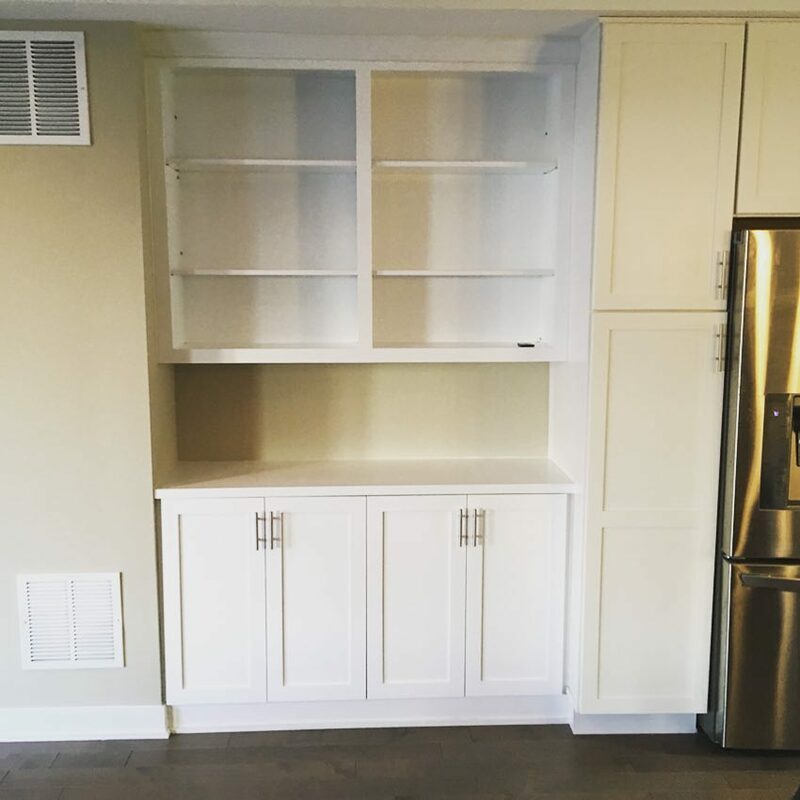 We installed open shelving and cabinets into a previously existing alcove, dramatically increasing their functional kitchen space. To make the look seamless, we replicated the current cabinet style, installing modern white inset doors with chic metallic pulls. These gorgeous two-tone cabinets and marble countertops really made this kitchen renovation shine. The lighted glass-front cabinets make the room feel huge and provide an inviting warm light. The navy cabinets anchor the room beautifully and allow the marble countertops to stand out. Here’s a better view of the lower cabinets and countertops. A nice mix of cabinets and drawers provide plenty of storage options and make it easy to stay organized. We loved working with such a gorgeous color palette. 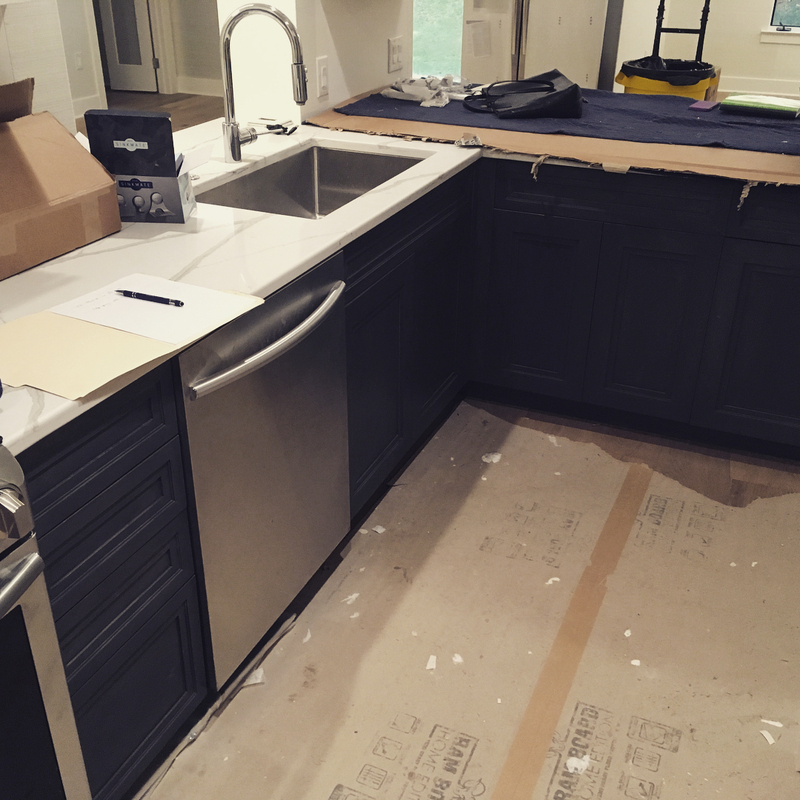 Navy cabinets contrast nicely with stainless-steel appliances. And, the stainless steel makes the silver veining in the countertops really pop. When it comes to a kitchen remodeling project, all of the little details count! Opposite the sink and dishwasher is the wall-to-wall pantry. Made to blend into the wall, this pantry will give our clients tons of space to organize all of their spices, cookware, and appliances. We also installed pivoting pocket doors to provide even easier access to the pull-out drawers on the right-hand side. 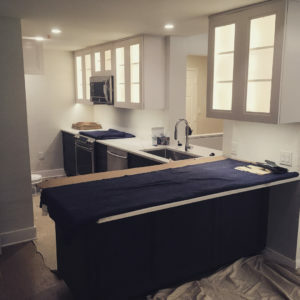 Need Kitchen Remodeling, Philadelphia PA? Start Your Project Today! To get started on your kitchen remodeling project, schedule your complimentary consultation today. We’ll work with you to design the perfect custom cabinets for your kitchen. To see more of our work, don’t forget to follow us on Instagram and Houzz!